We hope you enjoy this list of resources to further engage with the beautiful Berkshires! 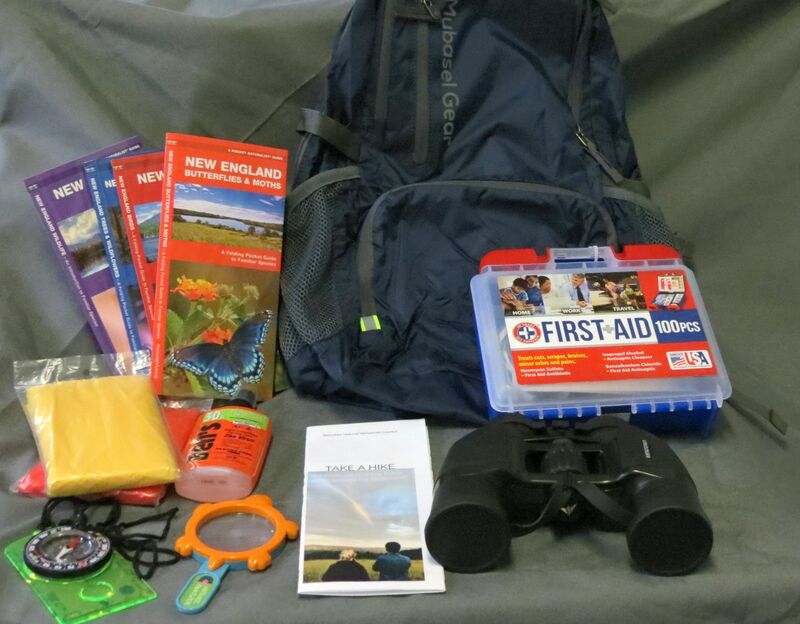 Library in the Wilderness – Check out a backpack from the Berkshire Athenaeum, fully equipped with field guides, BNRC trail guides, a basic first-aid kit, a compass, binoculars, a magnifying glass, bug spray, two ponchos, and an observational journal. Environmental Education Programs – The Berkshire Natural Resources Council Offers Environmental Education Programs to youth-centered organizations: All About Seeds, Animal Tracks in Winter, Getting Ready for Winter, and Why Do Leaves Change Color. Contact Mariah at mauman@bnrc.org or 413-499-0596 if you’d like to host a program! Lessons – Helpful resources for educators. iNaturalist App and Website – Record your observations. Share with fellow naturalists. Discuss your findings. Every observation can contribute to biodiversity science, from the rarest butterfly to the most common backyard weed. Your findings are shared with scientific data repositories to help scientists find and use your data. All you have to do is observe. Merlin Bird ID App – Browse more than 8,000 stunning images taken by top photographers. Merlin also includes more than 3,000 audio recordings from the Macaulay Library, identification tips from experts, and range maps from the Birds of North America Online and Neotropical Birds. eBird App and Website – Explore birds and hotspots near you and wherever you go, all based on the latest sightings from around the world. Share and keep track of your sightings! Northern Woodlands Website – The mission of the Center for Northern Woodlands Education is to advance a culture of forest stewardship in the Northeast and to increase understanding of and appreciation for the natural wonders, economic productivity and ecological integrity of the region’s forests. Northern Forest Atlas Articles Articles are short to medium-length, illustrated documents. Some, are stand-alone pieces. Others are segments of running blogs. The film discusses the forests experienced by the first Europeans who saw them and what transpired after settlers took to the land, to the present day explorers and scientists who have rediscovered some real treasures. Featured are a number of prominent ecologists who have studied our old growth remnants. A stunning four-color wall map of Berkshire County is the most recent result of BNRC’s collaboration with cartographer Patrick Dunlavey. The map features public conservation land, along with roads, trails, topography and vegetative cover. Buildings and driveways are also shown, along with historic sites and other cultural features. The map will prove invaluable in any office, shop or storefront whose work relates in any way to regional geography. These utilitarian purposes are more than matched by the map’s high design standards and sheer beauty, making it suitable for hanging in any home. 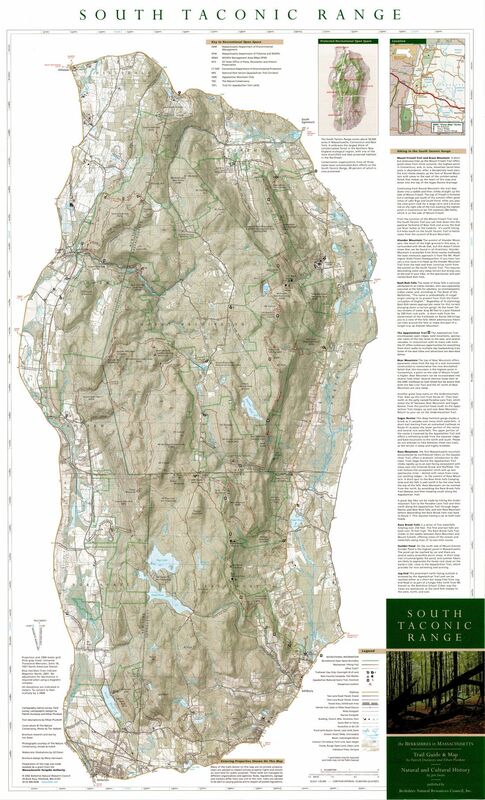 The 32″ x 50″ map is available at the Arcadian Shop and other retailers in Berkshire County. BNRC has also contracted with a specialty New England framing company to have the map laminated and gallery mounted. The result is a durable, low-glare framing solution. Mounted maps are available at the above locations. The Berkshire Natural Resources Council believes that simply conserving land is not enough. We must also strive to make conserved land accessible. The Green Series was our effort to make public open space more accessible to the public by providing high quality maps and trail information that allow and encourage people to use and appreciate these lands. Each map has two sides printed in color. The map side includes trails, topography, shaded relief, forest cover, land ownership, and text descriptions of highlighted trails. The backside of each map is a guide to the natural and human history of the area. To date we have completed guides of Yokun Ridge, Mount Greylock, and the Southern Taconic Range. 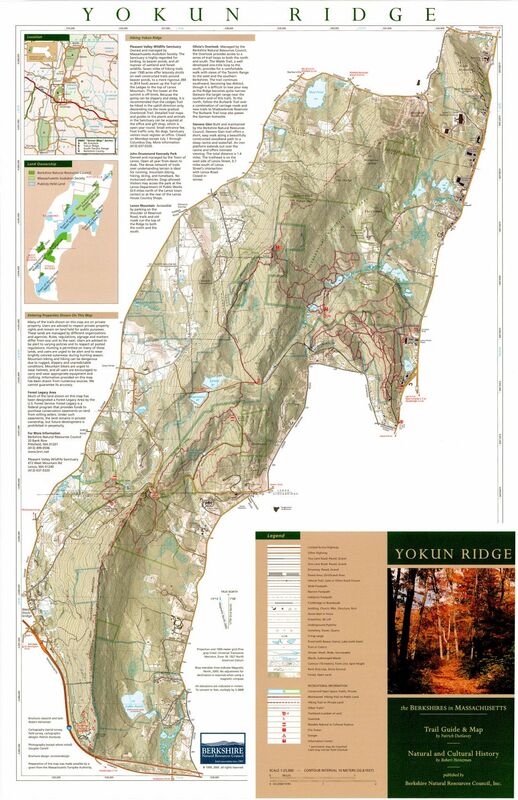 This map covers Yokun Ridge, the dominant land form of Central Berkshire. In this area the Berkshire Natural Resources Council has worked through land acquisition, trail construction, and advocacy to protect and connect land owned and managed by many different entities. These include the BNRC, Massachusetts Audubon Society, Massachusetts Department of Environmental Management, the Towns of Lenox, Stockbridge and West Stockbridge, the Mass Highway Department. In addition to the efforts made by the aforementioned groups, Yokun Ridge has been designated as a Forest Legacy Area by the U.S. Forest Service, which holds conservation restrictions on several parcels along the ridge. Some highlights on this map include Olivia’s Overlook, Stevens Glen, Pleasant Valley Wildlife Sanctuary, Kennedy Park, the Burbank Trail and Shadowbrook Reservoir. 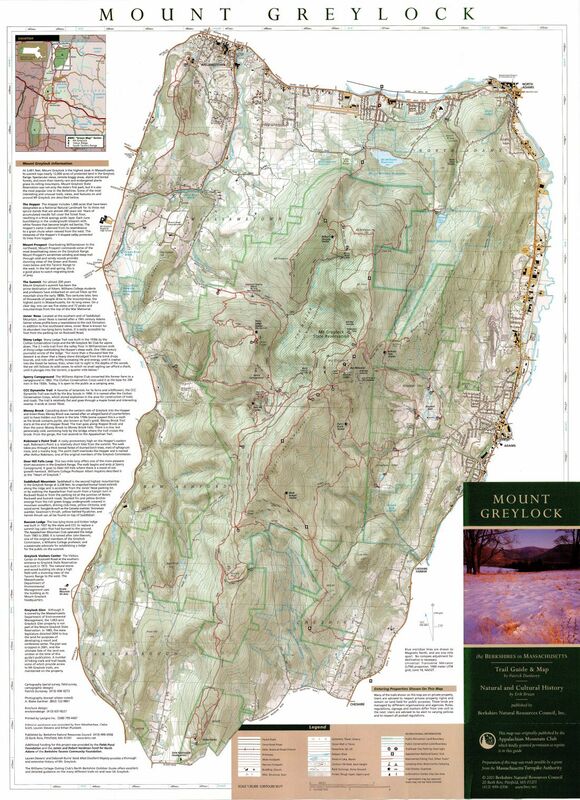 This map covers Mount Greylock and the conserved lands surrounding it. Greylock, the tallest mountain in Massachusetts, has a history as rich as its ecology. Spectacular views, remote boggy areas, alpine and boreal forests, and more than twenty rare and endangered plants grace its rolling peaks and ridgelines. Its tower-topped summit is a landmark for miles around and a defining characteristic of the Berkshire landscape. This guide details the flora and fauna found in the area as well as the long human history on the mountain. Highlights include: The Hopper, Mount Prospect, the Greylock Summit, Jones’ Nose, Stony Ledge, Sperry Campground, CCC Dynamite Trail, Money Brook, Robinson’s Point Trail, Deer Hill Falls Loop, Saddleball Mountain, Bascom Lodge, and Greylock Glen. 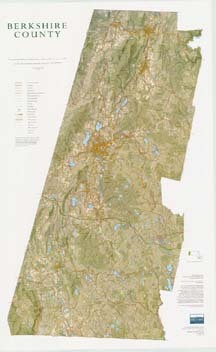 South Taconic Range covers a large unfragmented forested highland at the junction of Connecticut, Massachusetts, and New York in the southwest corner of Berkshire County. This map unites on one page a remarkable human and natural landscape that falls within three states. The spectacular combination of exposed ridges and peaks, steep mountain streams, waterfalls, and superb natural history make this area a great hiking destination. The South Taconic Trail, Appalachian Trail, and numerous side trails provide access for both day and overnight hikes. Some highlights include Bash Bish Falls, Frissel Mountain (the highest point in Connecticut), Race Mountain, Bear Mountain, and Sages Ravine.